A deacon has appeared in court over 41 counts of indecent assault following a historical sexual abuse investigation at a Greater Manchester school. 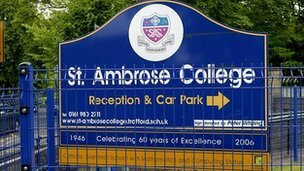 Reverend Alan Morris, 63, from Hale, who taught at St Ambrose RC College in Hale Barns, Altrincham, is accused of offences between 1972 and 1991. He did not enter a plea at Manchester Magistrates Court and will appear at the city’s Crown Court on 15 August. The Diocese of Shrewsbury said he had been “withdrawn from active ministry”. The allegations involve 29 former pupils of the boys-only school, who were aged between 11 and 17 at the time. Mr Morris, of Rivington Road also faces charges of one count of outraging public decency and five of inciting gross indecency. He was working as a deacon at Holy Angels Church in Hale Barns at the time of his arrest but had been “withdrawn from active ministry”, a spokesman for the Diocese of Shrewsbury said. He said that while the alleged offences were “unrelated to his ministry as a deacon”, he had been taken off active duty “in accordance with statutory safeguarding procedures”. At the time of the alleged offences, the Altrincham school was run by Roman Catholic religious order the Christian Brothers.